The coin itself is a denarius of Vespasian (AD 69-79), a silver denomination which in this case dates to AD 70. The obverse shows the emperor, laureate and facing right whilst the reverse shows Pax, the personification of peace, sat casually holding a palm branch signifying peace and the cauduceus symbolising power. This simple image hints at a greater story. 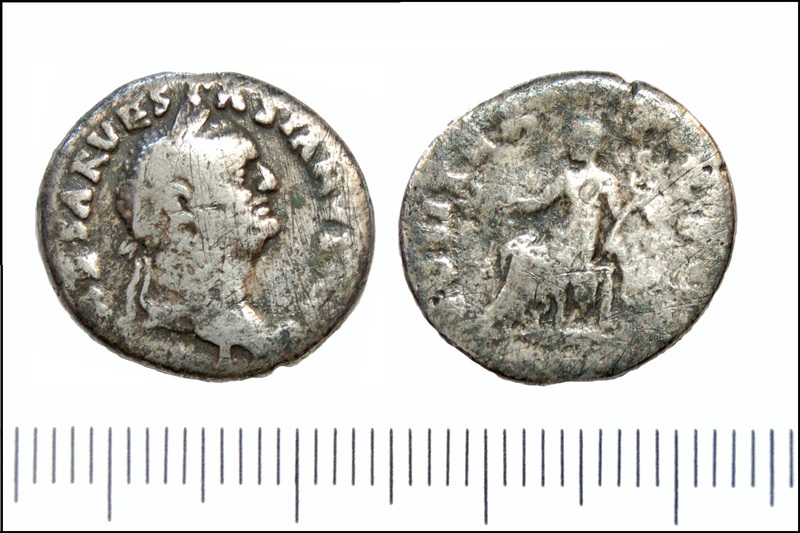 After defeating Vitellius and bringing the year of the four emperors to an end Vespasian had restored peace to the Empire which seemed to teeter on the edge of anarchy, so the portrayal of peace on his coinage is very apt: peace had been returned by Vespasian and so Pax resided on his coins. Every coin has a message, a meaning or a story to tell and that is what makes them so fascinating and important. But for me this fascination is only compounded by their nature: they are something so recognisable, so relatable but yet so exotic due their extreme age. Furthermore as a class of artefact they hold a unique place in the world of artefacts being one not only archaeological, but historical due to their legends and artistic too in the finesse of their execution. Simply, they are a treasure in every sense.